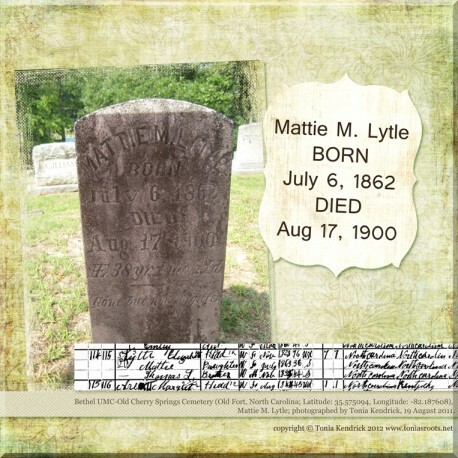 Mattie M. Lytle was the youngest child of John and Elizabeth Lytle of McDowell County, North Carolina. Mattie was born 6 Jul 1862 and died 17 Aug 1900. She never married. She appeared on the 1900 census in her mother’s household, enumerated only two months before her death. Mattie is buried at Bethel UMC-Cherry Springs Cemetery in McDowell County. My First FHL Film - Score!